The effort of travel is almost always worth it for the stunning photos we bring back as souvenirs. While they never recreate the magic of being on a pearly beach or a temple in the rainforest, they can transport you to faraway lands in an instant. The National Geographic's new travel photography competition, which is entering its second week, proves this. Drawing in scores of entries from around the world, from a cow race in Indonesia to a fur seal chasing its prey in Antarctica, each snapshot is as dramatic and enthralling as the last. The competition, which takes place each year, is accepting entries until 12pm on May 3rd, with three categories available: nature, cities and people. "We are looking for images that show us the world: its people, places, and cultures. Photos that tell the story of a place and travel moments that reveal what inspires you", writes the publication. The grand prize winner of the new competition will receive a €6,700 prize and be featured on National Geographic's Travel Instagram account. This dramatic and awe-inspiring photo was captured during a similarly dramatic event. "This was my first ever hike to taft point in Yosemite National Park. I had seen so many beautiful pictures of this location before. 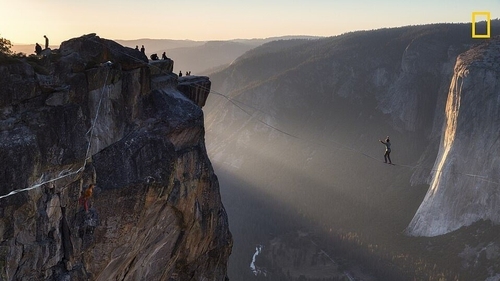 "After reaching the point, I saw these slackliners. It was amazing to watch these guys over the high cliffs. The setting sun made it even more awesome with its rays beaming through the valley. What a sight! Felt really lucky to be at the right place at the right time." The vibrant colour and sense of motion is what distinguishes this shot by Clive Beavis. "This image was captured on a recent visit to Antarctica. I had this shot in mind, though no idea how I would get it. I had seen a similar photo in a Nat Geo publication. "Lucky for me, a young southern fur seal decided to chase a group of Gentoos—right towards our Zodiac. It even has its mouth wide open to add to the drama. Right place, right time for this shot." This image, captured by Francesco Riccardo Iacomino in Aigues-Mortes, Manguedoc-Roussillon, France, is cinematic and full of life. "The white Camargue horses are living in the wild, but are being guarded and managed by the 'guardians,' French Cowboys." "We were lucky to find new born lion cubs in the plains of Masai Mara, Kenya", Sonalini Khetrapal writes of her photo. "The mother is extremely protective of the cub and was often seen hiding them behind the bush and away from predators. "In this instance, as the cub unknowingly walked very close to the side of a cliff, the mother lioness quickly tried to grab it from its head to protect it from falling over. It looks dangerous, but it is an endearing way for the lioness to pick up the cub and place it back to safety." Andrew Zapanta shares his personal connection to a city in his shot. "I was standing on the corner and I felt that the essence of Manila was unfolding in front of me. It seemed like the epitome of the city—the constant buzzing of motorbikes, colorful buildings, endless electrical wires overhead, the smell of street vendors barbecuing, and the sun beating down. "Manila, to me, is visceral, colorful, hot, and always non-stop. The people are some of the friendliest I have met—never too busy to say hello with a smile." Aya Okawa captured this alternative view of the popular Hawaiin destination. "A Honolulu neighborhood at sunset. Houses squeeze onto the unique ridges carved by aeons of rainfall on volcanic rock." James Vodicka captions this elegant photo simply: "A sea turtle ascends to the surface for a breath, near Heron Island on the Great Barrier Reef." This birdeye-view of a packed bay was taken by Azim Khan Ronnie. "The 500 enormous vessels used to transport bricks, sand and other goods, are either being built or are docked for maintenance work in Dhaka, Bangladesh. Shipbuilders in Bangladesh began exporting their ships to other countries in 2009, and it has since become a growing trade in the area." An ethereal image of calm took years to create. "It was a quiet morning at Nagarahole Tiger Reserve—the sun was opening up and the mist from the night was clearing. As we made a drive through the woods, we saw this beautiful leopardess perching on her favorite tree. "Ever since I started wildlife photography, I wanted to photograph a leopard on the tree. It took over three years to find the photo. I love everything about this picture—a prowling leopardess, a beautiful tree with the white flowers, soft sunlight—it was just a perfect setting." Dale Johnson harnesses the essence of high-octane cow racing in Sumatra. "The mud flies as the cows race through the rice paddies during the traditional pacu jawi on the island of Sumatra in Indonesia." You can view more, and check out the selected best entries of each week, on the National Geographic site.